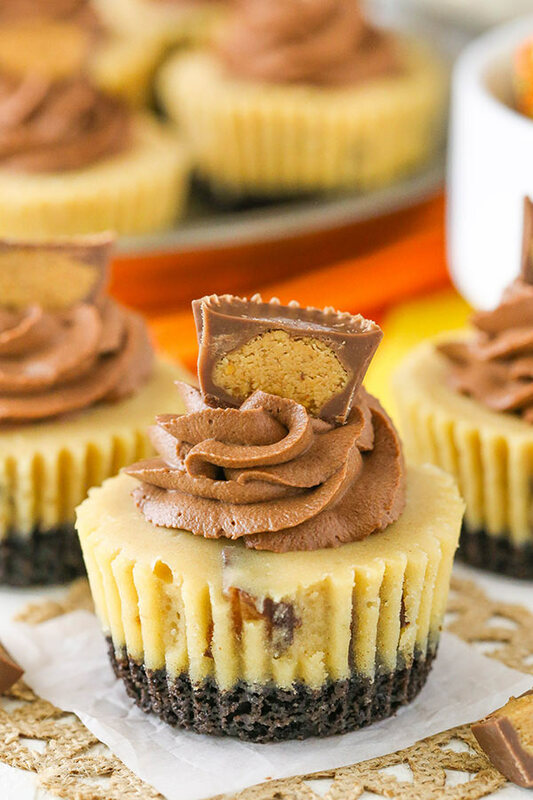 These Mini Reeses Peanut Butter Cheesecakes are full of peanut butter and chopped Reeses! 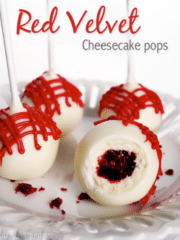 Such tasty little treats that are easy to make! I feel like I’ve done a good bit of “adult-ing” lately and it’s always a weird feeling. 🙂 I mentioned before that we’ve been looking at homes and considering a move, but we’ve also been preparing our house to be listed to sell. In doing so, we’ve had painters coming to give quotes and paint, as well as others coming to help with getting things ready. I’m not sure much feels more like “adult-ing” than getting a house ready to sell and then buying another one. Major decisions! 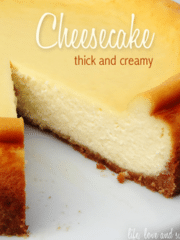 To start off making these cheesecakes, you’ll make the crust. I used an Oreo crust, because Oreos. YUM! But you could also do something like a Nutter Butter crust, if you wanted to add more peanut butter flavor. 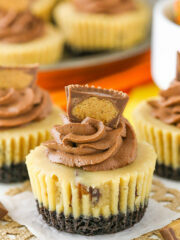 Just mix the cookie crumbs with the butter and divide the mixture between the cupcake liners. 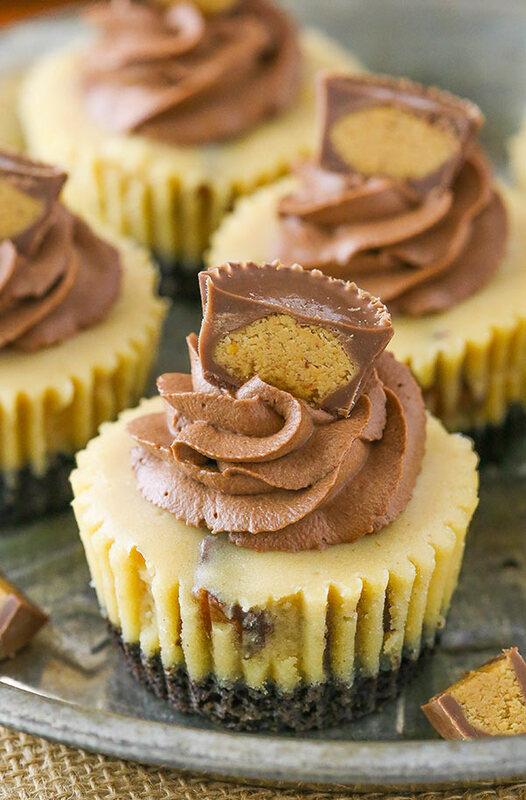 The filling itself is flavored with peanut butter and Reeses. It’s easy to put together too. Plus, once you add the filling to the cupcake pan and bake it, the baking time is much less than a regular sized cheesecake. They bake quickly and don’t need a waterbath. Big score for ease, convenience and being able to devour them more quickly! 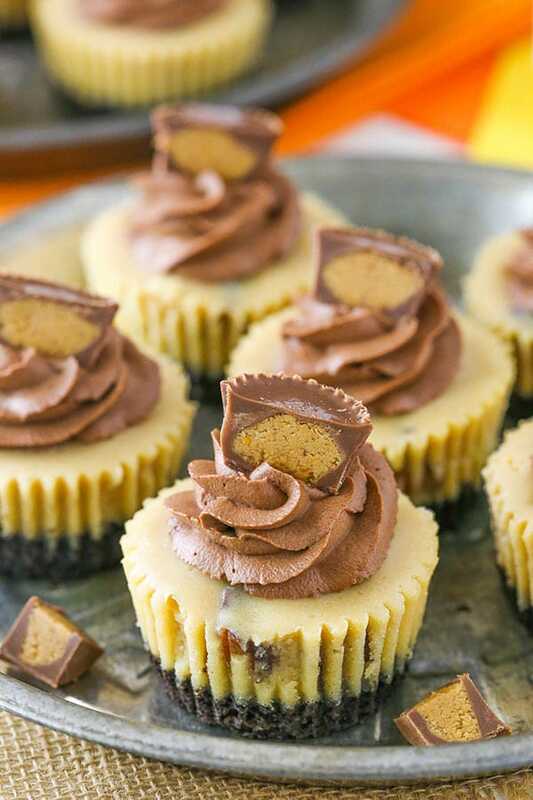 Top off the cheesecakes with a swirl of whipped cream and a half of a Reeses. These little treats are such fun! 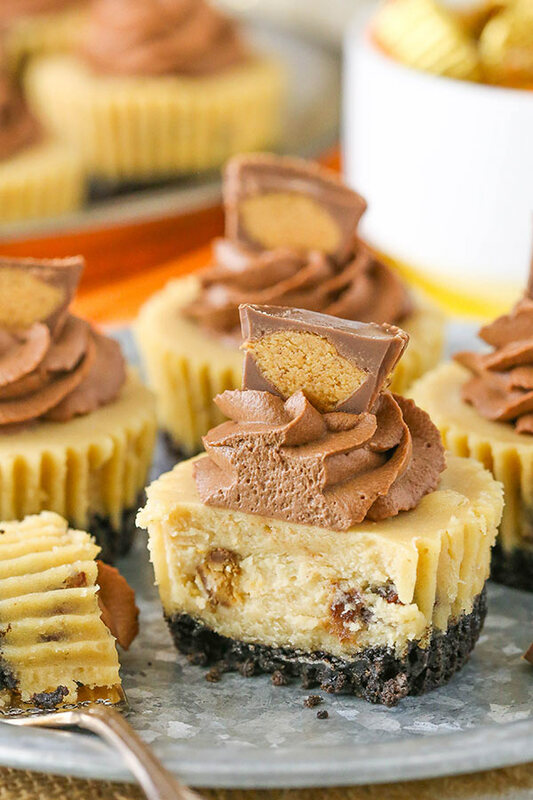 Not only do Reeses just get me all excited, so does cheesecake. 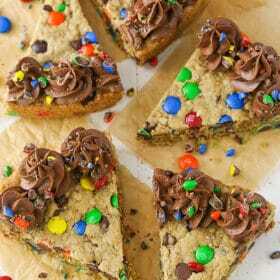 When you combine them, it’s pretty much an irresistible dessert! I hope you love them too! 3. Add the sour cream, peanut butter and vanilla extract. Beat on low speed until well combined. 4. Add eggs one at a time, beating slowly and scraping the sides of the bowl after each addition. 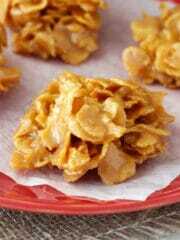 Gently fold in the chopped Reeses. 8. Once the cheesecakes are cooled and firm, make the whipped cream. Add the heavy whipping cream, powdered sugar, cocoa powder and vanilla extract to a mixer bowl fitted with the whisk attachment and whip on high speed until stiff peaks form. 9. 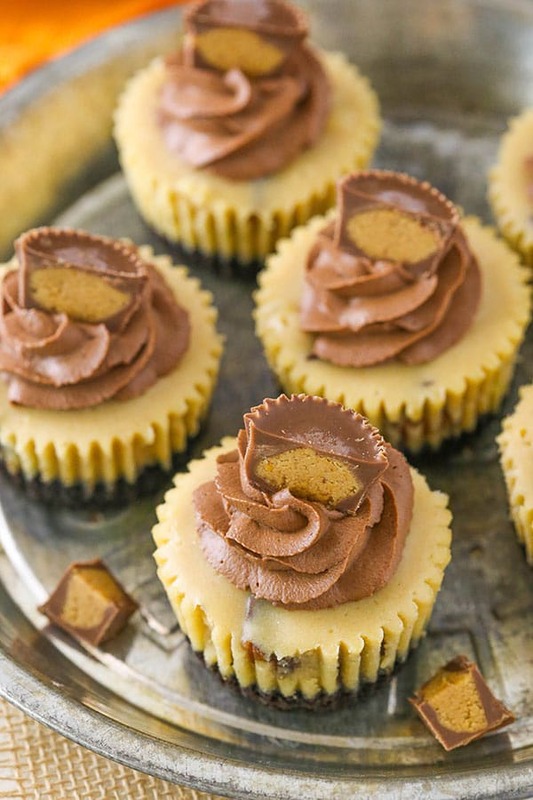 Pipe swirls on top of each cheesecake, then top with half of a mini Reeses. I haven’t used one of those pans before, so I’m not sure. Can you freeze these? I would like to make them for my daughters wedding. Yes, they should be fine frozen when well sealed. Just thaw them in the fridge. This recipe looks like it was made just for me. So many of my favorites all wrapped in a mini size! Love love love! Will definitely be trying this – although I think i’ll try the Nutter Butter crust… Mmmmm! hey girl- these look so gooood! Lindsay, thank you. This recipe sounds wonderful. 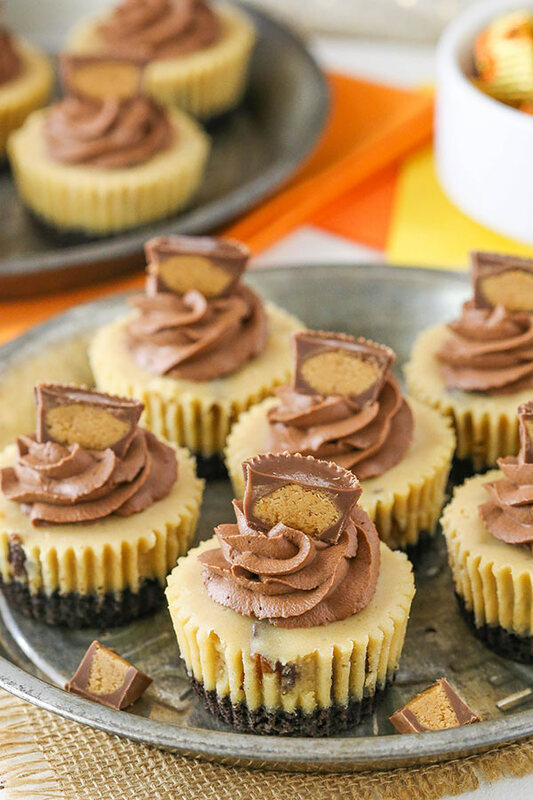 Reese’s peanut butter cups – my favorite! hmmm, nutter butter white chocolate reeses, although it would not look so lovely. I have always wondered what type/brand peanut butter you prefer. I’m sure, that with all of your experimentation you must have found a favorite…and what makes it so? I honestly haven’t tried too many brands. I use full fat creamy JIF at home and that’s what I most often use in recipes. I have made these and they are delicious. Thank you for the recipe. Just one question – what size cases do you make these in? The first time I used mini cup cake cases but they were too small. Then I used standard cases but even making 20, they were also too small. So is it muffin sized cases? Thanks. I use a standard cupcake pan. 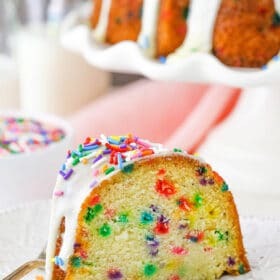 Can you provide a link for the cupcake pan you use? I looked on Amazon and I’m not finding many good options for a “cupcake” pan. Thanks! Looks like it’s called a muffin pan. I use this one (affiliate link).